Anything and Everything: John Axford - Future Filmmaker? Welcome everyone to my personal blog. I'm really looking forward to sharing all my insights with you, and I would love to hear your comments. Blogs are all about voicing your opinion, so let's look to do that as much as possible. ENJOY! John Axford - Future Filmmaker? 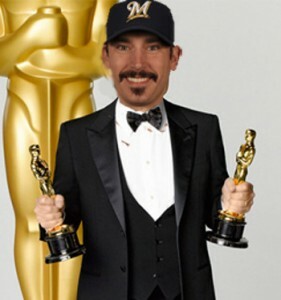 For those Brewers fans who don't know, John Axford is a HUGE film buff. He took to Twitter on Sunday to talk about the Oscars and his predictions, as he correctly picked 11 out of 13 winners. But his love for film goes beyond watching movies, as he has lots of stories in his head and has ambitions to take a shot at film in the future after his baseball career comes to an end (which hopefully won't be anytime soon). To my and many Brewer fans' surprise, it looks like John has already begun preparations for a potential film career after baseball. A spec script that John has been working on during the offseason has surfaced, and while I can't 100% confirm the scripts validity, I can say it sounds like it'd be an epic flick. To read the few pages of the surfaced script, click here.